The study of amphora inscriptions has a long tradition. It started as a minor and auxiliary field, contributing to the grander scholarly work on monumental epigraphy. Since the late nineteenth century though, amphora studies developed and amphora epigraphy was one of the major early instrumentum domesticum research areas. Underwater archaeological research played a special role in contributing to the fast development of amphora studies since the 1950s and major excavations all over the Mediterranean and beyond led to a sprout of amphora epigraphic studies. Even though there is still somewhat a lack of communication between Greek and Latin epigraphists, there is a growing recognition that the study of inscriptions on amphorae can gain a lot if Greek and Latin inscriptions are studied as interrelated. Amphorae were common, Pan-Mediterranean vessels, and the economic, social, political and even cultural issues raised by amphora inscriptions related to both Greek and Latin inscriptions. José Remesal is a well-known amphora specialist and a leading student of amphora inscriptions and this edited volume proves how scholars from several countries can contribute together for the advancement of our knowledge of ancient inscriptions and societies. The volume is divided into two parts, on Greek and Latin epigraphy, the former with four and the latter with fifteen chapters. 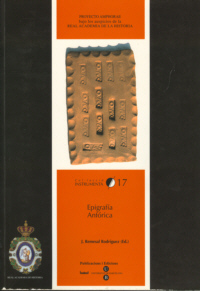 There are several chapters dedicated to the discussion of amphora inscription publication and cataloguing. Some chapters prefer to tackle the tricky epistemological issues relating to amphora inscriptions; a difficult task dealt with by senior scholars, such as Yvon Garlan, André Tchernia, and José Remesal, but also with instigating contribution by several others. Some chapters concentrate on a detailed updating of regional issues. Yvon Garlan supports a whole amphora inscription-publishing programme, stressing the need for a continued attention to cataloguing and publication, in traditional, paper-based, and new digital media. André Tchernia starts by praising the fact that mostly archaeologists now publish amphora inscriptions, as the only way to understand such an epigraphic message is to fully understand the material evidence. It is thus not enough to be a good Greek or Latin philologist, for the material context is a key for understanding most if not all those inscriptions. Tchernia concludes his masterpiece referring to the CEIPAC database as model for the field, praising the efforts of the Barcelona team. Other efforts are also important, such as those of the Centre Camille Jullian (Antoinette Hesnard), the Testimonia Epigraphica Norica (Manfred Hainzmann and Reinhold Wedenig), or the La Sapienza Rome University (Clementina Panella). Even though most databases are concerned with stamps and graffiti, Antonio Aguilera shows how a creative approach can be useful for a digital file for painted inscriptions, whilst Stephanie Martin-Kilcher zooms on fish sauce tituli picti. There are different approaches to regional studies. Niculae Conovici relates Sinope stamps bore on amphorae and on tiles, as most of them are the same. Others prefer to study stamp publication, as in the case of stamps produced in Rhodes (Gerhard Joehrens, Gerald Finkielstejn). Particularly comprehensive are the overviews. Victor Revilla studies Hispania Tarraconensis, stressing the importance of amphora inscriptions for understanding not only the economic and social life, but also culture. Lázaro Lagóstena deals with fish-sauce inscriptions from Baetica and Carlos Fabião and Amílcar Guerra offer a complete analysis of Lusitanian amphorae, stressing that whilst stamps are not common, so are the graffiti. Three other producing areas are studied in detail, Brindisi (Silvia Pallecchi), Gaul (Fanette Laubenheimer) and Northern Italy (Tamás Bezeczky). An unusual comparison between amphora and barrel inscriptions, by Elise Marlière shows the importance of an archaeological approach to those ancient inscriptions. Two chapters sum up the main interpretative issues relating to the most complex and well-known amphora inscription system: those of the Spanish olive oil Dressel 20 type. Ute Ehmig challenges the now standard interpretation of amphora stamps, as Tria nomina are usually considered as references to olive oil producers. She goes back to Heinrich Dressel's original proposal and interprets them as referring to the owners of potteries. Ehmig however does not propose a comprehensive understanding of Dressel 20 stamping. Instead, she prefers to consider that there were probably changes over time and there is thus no way we can study them as a coherent system. Her overall negative approach discourages further research, but science needs scepticism to temper prevailing interpretive schemes and Ehmig's doubts serve well this purpose. José Remesal produces a complete study of Dressel 20 epigraphic system, starting by emphasising the importance of archaeology to write ancient history. 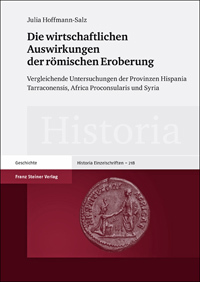 Remesal studies in detail the producing areas in Southern Spain and potteries are understood in their geographical, but also Roman political context. Stamps are studied as archaeological artefacts, the result of archaeological research in the producing areas. An original matrix found at La Catria (Sevilla, ancient Hispalis) has served as part of an experimental archaeology exercise and it also enables us to discuss metrological issues relating to amphora stamps. Remesal then turns his attention to the archaeology of importing areas, particularly the Testaccio, the huge archaeological site studied in Rome under his direction. The excavations at the Testaccio have been instrumental for a much better understanding of painted inscriptions. Last, but not least, Remesal sums up a plethora of archaeological surveys relating to the distribution of amphora inscriptions. In the last twenty years or so, there has been a whole series of substantial collection of amphora inscriptions and resulting interpretive studies, comprising evidence from Germany, France and Britain, not to mention smaller areas of the Roman Empire. As an edited volume, the book could not aim at producing a comprehensive introduction to amphora epigraphy, and even less so a coherent and consensual approach. There is also an imbalance, as Latin epigraphy represents three quarters of the whole volume, but there is indeed more research on Roman amphorae, even if probably not in such a proportion. Within Latin epigraphy, some provinces are more thoroughly dealt with, as is notably the case with Roman Spain, whilst several others are not mentioned at all. As it is not a manual, all these features are common currency and do not represent any problem. The strengths of the volume though are manifold, starting with the discussion of both methodological and interpretive issues. Amphora and epigraphy scholars are thus well served in both counts. Furthermore, several chapters offer fine interpretive frameworks, showing how amphora inscriptions are nowadays important for a social, economic and cultural history of the ancient world.